This entry was posted in Authors, Christianity, Great books, Uncategorized and tagged 2015 Readers' Choice Award, Aragorn and Arwen, Barnabas Collins and Victoria Winters, Conrad Richter, Daniel Boone, Dark Shadows, Dorothy Sayers, Downton Abbey, fanfic, Father Tim and Cynthia, High Chaparral, House of Cards, Jeri Taylor, Kristin Lavransdatter, Lord Peter Wimsey and Harriet Vane, Mitford, Mulder and Scully, noromos, Picard and Crusher, Remington Steele, Scarecrow and Mrs. King, series, shippers, shipping, Sigrid Undset, Spock and Kirk, The Awakening Land, The Lord of the Rings, The X-Files, Trip and T'Pol by Sandra Hutchison. Bookmark the permalink. I can’t write romance at all, so even in my fanfic writing days (Harry Potter) I wrote mainly gen, not romance or slash like I would have if I were writing my ships (Sirius/Lupin 4ever). Didn’t you say you shipped Harry/Hermione BTW? My ship of choice these days is an ancient, ANCIENT one done modern: Sherlock/John from Sherlock! And Frank Underwood/*everyone*, haha. I did quietly ship for Harry and Hermione, but I suspected it was hopeless and never crossed over into being a fan with those. I think at some level I just always thought of them as kids. Besides, in a realistic version of that story, Harry would suffer from lifelong depression after his brutal childhood, never able to feel truly loved enough, and thus make a terrible husband, and Hermione would have gotten bored and disgusted by feckless Ron in a matter of weeks. (I’m so mean.) I did very much enjoy Sherlock for that friendship for the first season or two. The last season I watched was just so frickin’ silly. Sometimes I wonder if the show writers start to read too much fanfic themselves. > The last season I watched was just so frickin’ silly. Yeah, agreed, SO not a fan. > I just finished House of Cards last night. oooh, then we must have a chat soon. 🙂 Did you like this season? I’m on the fence. (SPOILER ALERT, anyone who’s watching even more slowly than me.) I agree with Saurabh that it was not as good as last season — lost its evil sense of humor, had some weird relationship turns that seemed thrown in for shock value alone, and there’s absolutely no one left to root for, other than the occasional reporter. But I’ll keep watching if only because I so badly want Frank to get what he deserves. Or, somehow turn out to lead the country into better days because it’s forced on him politically. I still can’t decide if this might be some sort of weird take on Lyndon Johnson and the Clintons. I have wondered about the whys behind shipping. I personally enjoy watching two people grow together within a relationship. I like seeing the shared experiences that helps them get closer to one another. I like to watch love blossom and unfold. I like seeing the portrayal of softness and vulnerability. I prefer that there are feelings involved before the two kiss (if they do). Quick couplings are not very satisfying or meaningful to me. Why ship some couples and not others? That part is a mystery to me. Is it the chemistry between the actor and actress? Is it because I’m attracted to the male character or do I often become attracted to the male character because I am watching him closely? My daughter ships the slash couple Destiel (two male characters, Castiel and Dean from Supernatural). I find both men attractive and I do think TPTB play it at times, but subtly so viewer interpretation may vary. I did try an episode after the one that annoyed me, and just reading the description — another main-character-kidnapped story two parter — made me go “Nope, I just don’t even want to go there.” And that was it. I also wonder if streaming and on-demand make me way more likely to think, “Eh, I’ll catch up with that someday when I have more free time or I’m sick on the sofa.” Must be rougher these days for shows trying to get the ratings they need to stay alive. I liked that the writers actually showed the audience that first real kiss. I agree that things have gone downhill since midway through season 6. They lost me some when Kate Beckett was already married, but apparently didn’t realize it. That followed by the whole season six finale….I do love the characters, though. WHUT? Oh boy. Is she Kate or isn’t she? Castle is the one who’s supposed to be the charmingly hapless twit. It’s probably good that I stopped when I did. Though I liked the supporting characters, too, so … eh, maybe someday when I don’t have something better to do I’ll go back and catch up. I have been watching The X-Files again with Emily. She likes all of my ships. 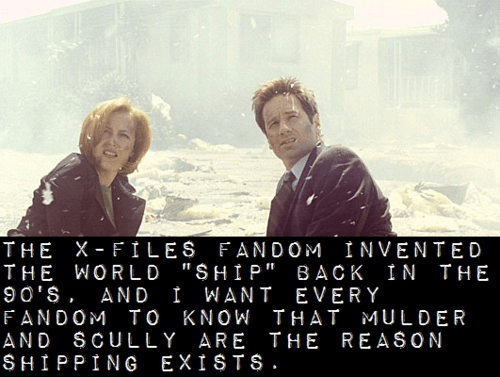 🙂 I have decided that Mulder and Scully are still my favorite television couple. Despite the mess of seasons 8 and 9 and the fact that we never really saw them get together, there is a tenderness in that relationship that melts my heart.